Hong Kong has a subtropical climate with four seasons, and weather strongly influenced by two monsoons: the north-northeast monsoon from October to March and the south-southwest monsoon from April to September. Spring – from February to April – is warm and humid, with average temperatures of around 23°C (73°F). Weather is generally pleasant but the skies can be quite overcast. By summer, the humidity (around 80% is normal) and temperatures are higher. Heavy rain is a feature throughout the south-southwest monsoon, but particularly from June to August when thunderstorms are also common. Between July and September there is the risk of tropical cyclones, which come in from the South China Sea. There’s a well-organised warning system in place, whereby winds are numbered 1, 3, 8, 9 or 10 – anything rated as an 8 or above is taken very seriously and means the closure of schools and businesses. Autumn is, certainly in terms of climate, an excellent time to visit Hong Kong. Temperatures are pleasant both day and night, and humidity also falls. There’s also less rain – average rainfall in October is 101mm (4.3 inches), compared to 328mm (12.9 inches) in September. Winter is even drier but can be surprisingly cold, particularly in the evenings: mostly between 15–20°C (59-68°F), although it can be higher than this, and sometimes the temperature dips as low as 10°C (50°F). Overall, the best months to visit are the periods between the monsoons (March to April and October to November) when humidity is low, the skies are clear and the temperature is warm but not too hot. That said, there are plenty of indoor attractions in Hong Kong, so rain need not spoil a trip. Lightweight clothing and a light raincoat are recommended during the warmer months, while warmer clothes are useful in winter. It should be noted that even during the hottest weather, a jacket or pullover will be required for the sometimes fierce air conditioning indoors. The Hong Kong Special Administrative Region (SAR) consists of three main territories – Hong Kong Island, Kowloon and the New Territories – plus more than 260 smaller (and mostly uninhabited) islands, located where the Pearl River meets the South China Sea. Both Kowloon and the New Territories are located on the Chinese mainland, separated from Hong Kong Island by the narrow Victoria Harbour. 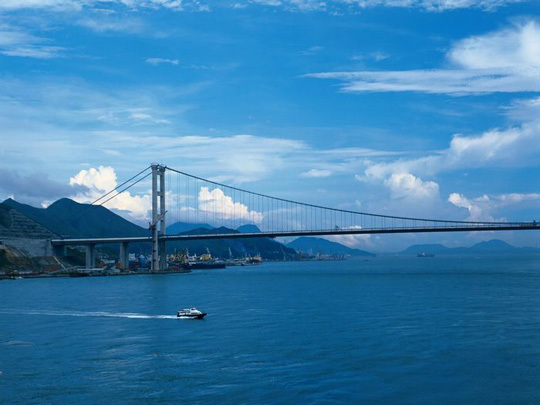 One of the world’s deepest natural harbours, this has been key to Hong Kong’s economic success. The SAR is hilly, with land on Hong Kong Island rising to its highest point at Victoria Peak (552m/1,811ft); in the New Territories, the mountain of Tai Mo Shan reaches 957m (3,140ft). Much of the developed land on Hong Kong Island, most notably the northern areas such as Central – site of many of the city’s best-known skyscrapers – is the product of reclamation projects. The same can be said of much of Kowloon on the other side of the harbour. The combination of hills and developed lowlands means that very little of the land within Hong Kong (only around 6% of the 1104 sq km/ 426 sq miles) is used for agriculture.